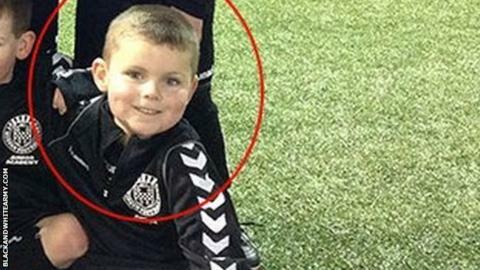 St Mirren fans have voted a six-year-old academy prospect as their player of the year - in recognition of his ongoing battle against cancer. Aaron Woodall is currently undergoing four courses of chemotherapy having already had radiotherapy and an operation to remove a brain tumour. Almost 500 fans voted in the poll on the blackandwhitearmy.com website. "Aaron's strength and courage has been an inspiration to all of us," a statement read. It added that his battle was "a timely reminder of things around us that are much more important than football". The youngster was mascot for the club's game against Motherwell on 20 December, hours after being released from hospital following surgery the previous month. "We will be in touch with the club shortly to arrange to hand over our coveted trophy to this fine young man," the statement added. "Congratulations, Aaron, and all the very best with your continued recovery." St Mirren's first team are one defeat away from relegation in the Scottish Premiership. The first-team player earning the most votes was midfielder Kenny McLean, who was sold to Aberdeen in January. Defender Jim Goodwin earned the most votes among players still with the Paisley club.